Getting your franchise business up and running fast with accurate cost-effective legal support, advice and documents has never been easier or more affordable. Have you been dreaming of franchising so you can skyrocket your success, build wealth and have a life with more free time and money so you can live the life and have the business you want? … Yet, despite your best intentions, your dream is always just out of reach? Does it seem that, no matter HOW many books you read, or videos you watch, or questions you ask, you still can’t seem to figure it all out, and now you’re just about to give up? The truth is, learning how to Franchise and understanding the legalities involved is pretty much impossible to do on your own. There’s just so MUCH you need to understand. So, we’ve brought together some of the foremost franchise authorities in Australia so you can get exactly what you want, tailored to the specific needs of your franchise business. This way you can confidently grow your franchise group rapidly knowing you can enforce your compliance requirements, protect yourself from unreasonable legal action, and maximise the number of territories and your franchise fee income. You work with some of the best franchise authorities in Australia. Plus you’ll receive these other three free bonuses! Currently our franchise lawyers act for more than 40 national and international franchise groups with exposure to over 200 franchise systems, acting for both franchisors and franchisees for over 23 years – so whatever your problem, we’ve probably seen it before. 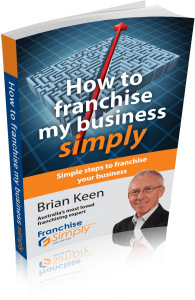 How to Franchise Simply founder, franchise authority Brian Keen has spent three decades working with businesses just like yours as a franchisee who owned and successfully ran multiple outlets. He’s been a franchisor who started and grew six new franchise groups and in five years and expanded them to over 120 outlets, a franchise consultant and broker and founder of an international franchise consultancy and with dozens of franchises such as Brumby’s, Jim’s Mowing, Donut King and Ultra Tune, developing franchise chains across Australia and internationally, helping all parties to come to grips with running this exciting form of business – so you are sharing in all this invaluable knowledge, so you do it right first time! So now you have a choice to make! Or you can make a modest investment to get all of the step-by-step help you need to set-up the franchise legals from someone who has already figured it all out, and can show you exactly what it takes to Franchise with success. Please contact Brian to discuss this option. I’ve already shown you plenty of examples of others who made the right choice, joined me, and are now enjoying their successes.